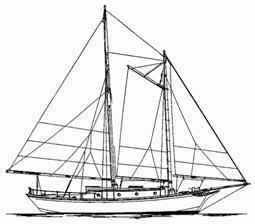 I have known the owner of a 30' V-Bottom Schooner, Little Maid of Kent (designed by William Atkin) for a while now since I had done some interior renovations on his boat back in 2005. 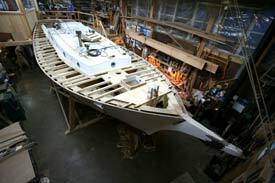 The boat is called “Kentish Maid”, with her construction being strip planked red cedar on oak frames, with polyester resin and fibreglass sheathing the hull, and was home built in the 1970’s. 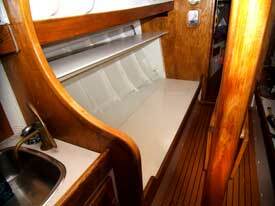 The boat was well built with a real touch of details that makes it an attractive boat with a real salty touch. 2005 job was to make a folding back of settee to convert seat to double berth instead of just a single. 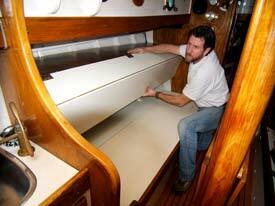 2005 Getting ready to cut opening for new ice box for in the galley. 2005 New ice box installed. 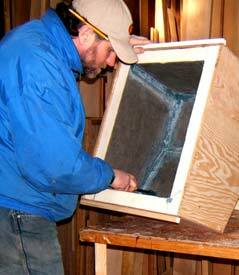 2005 Building the ice box in the shop. 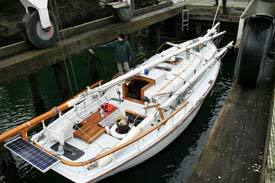 The owner enjoys using the boat every chance he can get and is very interested in keeping it in good shape. He phoned me up with some concerns and asked me to have a look at the stern taffrail and figure out what was wrong with it. 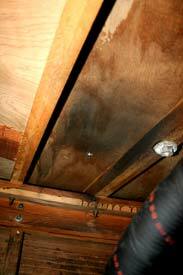 I could immediately see that a previous owner had painted over the original varnish to mask any problems. The trouble was that the rail was coming apart mostly because it was made of oak and held together with iron ready rod and galvanized screws, and the iron had started rusting, in turn, it was reacting with the tannins in the oak causing an acceleration of iron sickness. 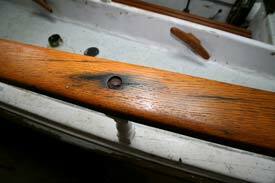 Blackened stained wood is a tell tail signs of iron sickness After the stanchion post is removed the extent of the damage was revealed. Photo taken under the deck of inaccessible area. The diagnosis was to repair the rail by removed it and rebuilding. 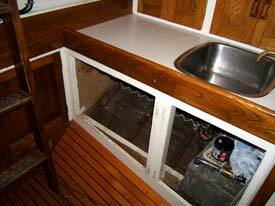 Unfortunately this ended up being the least of his problems; as I was turning to disembark the boat, I noticed when stepping on an area just behind the steering inspection hatch on the aft deck, there was a real spring to it. 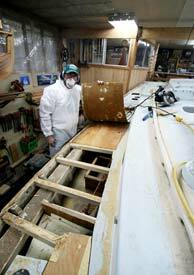 The deck and house were completely covered with polyester resin and fibreglass, with little ventilation in the aft of the boat, the plywood under the fibreglass was rotting away. After telling the owner of the new found problem, we met at the boat and with a hammer tapped the entire deck, mapping out all the other hollow sounding areas. Because we couldn’t get into the aft area of the boat to see the extent of the damage, I pointed a camera with a flash through the small hatch to take a picture to help show us the extent of the damage. 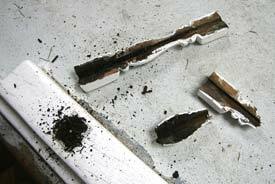 The problem was obvious, no good ventilation and inferior plywood was used for decking. My assumption being because this boat was built in the 70’s, a cheap non-marine plywood was used thinking the fibreglass would protect it. 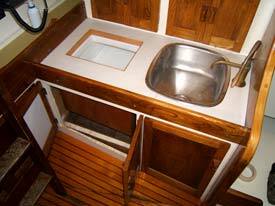 We talked about options for repairing, and because the problem areas were not just located in the aft of the boat, the proper job was to pull of the deck and replace it. The owner enjoys using the boat and also wants to maintain its value; his decision was to do the right thing and replace the deck as long as he could work with me on the repairs, as well he requested to bring her to a level that would look good at the local wooden boat shows. Getting ready to lift the boat, this also shows a good view of the Taffrail that started this process. 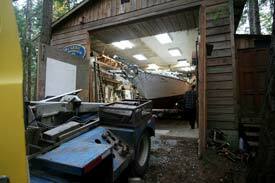 The boat mover backing the boat into the shop. 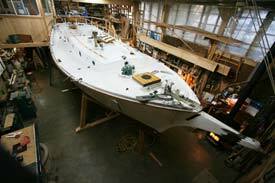 Since these discoveries, the boat has been pulled out of the water and trucked to my shop with all the work up till now being removing the deck. 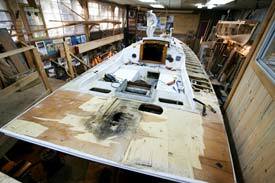 The boat just fit into the shop with the deck waiting to be worked on This shows the aft deck rotten areas.